Scott's tiny community made its first appearance in a limited-run Christmas comic strip, of a type many syndicates used to distribute at that time of year. This one came from Newspaper Enterprise Association (Short Ribs, Our Boarding House), and ran during December, 1950. It was so well received, NEA made a regular feature of it. 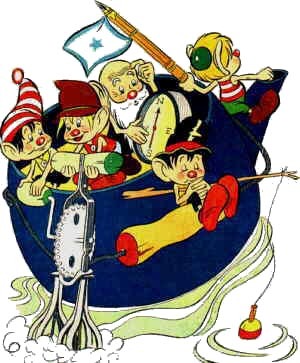 Scott (who had been working in a more "straight" style on NEA's Captain Easy for several years) launched The Little People (which he drew as a whimsical cartoon) on June 1, 1952. The Little People's community consisted of a mere five individuals: Chub, Cork, Jink, Loop and The Old One, all male. That they weren't the only members of their species was evidenced by the existence of their shiftless, conniving neighbors, The Groons, another all-male group. The topic of female Little People was seldom if ever brought up. Mostly, they socialized with the animal community in their woodsy locale. The following year, in addition to the Sunday comic, Scott began writing and drawing The Little People in comic book form. Dell Comics published it in the catch-all series, Four Color Comics, the 485th issue of which (August, 1953) was devoted to Scott's feature. Dell had already been publishing a similar series, The Brownies, which Walt Kelly (Pogo, Gremlin Gus) had set the tone for a tone which Scott (a former Disney man, just like Kelly) had closely duplicated. Dell phased out The Brownies within a couple of years, but The Little People was published in a total of ten issues of Four Color. The last of them was #1062 (December, 1959).